Results of research of IPM were presented on 53rd meeting of the Academy Assembly of the CAS – Ústav fyziky materiálů AV ČR, v. v. i.
fesults of research of fatigue lifetime of railway axles with high service reliability and safety were presented on 53rd meeting of the Academy Assembly of the Czech Academy of Sciences (CAS). The cooperation between BONATRANS GROUP, a. s. and IPM CAS, led to development of new methodology for reliable lifetime prediction of railway axles. 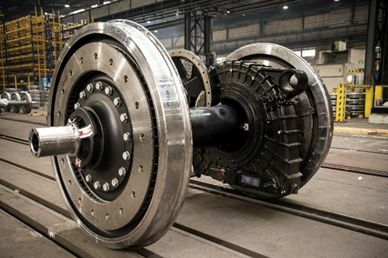 The methodology is based on simulation of fatigue crack propagation and can effectively predict failure of the axle taking into account complex loading and environmental conditions. The methodology was successfully verified using full-size test of the railway axle. The investigation contributed to the development of new railway axles BONAXLE® with high level of residual compression stresses. The new design procedure ensures longer service lifetime and operational safety. The cooperation between BONATRANS GROUP, a. s. and IPM ASCR was implemented within the frame of the Strategy AV21. The Figure above: Railway axle for NIM-Express train (BONATRANS GROUP, a. s.).